If you're a fanatic of anything rustic or farmhouse, then you have a love for burlap. I've been obsessed with attempting different ways to decorate with it for a few months now whether it's for a holiday or everyday decor. 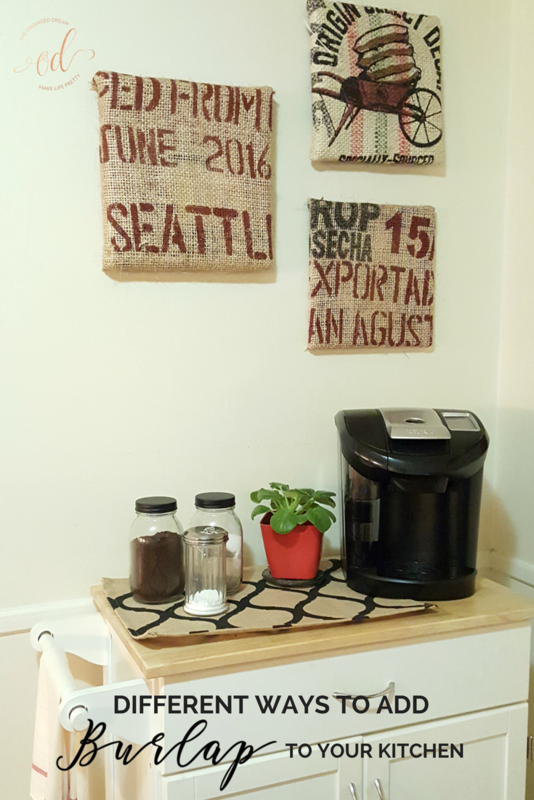 I'm pumped to share with you a few different ways I've incorporated it into my kitchen decor. Let's just start off with the wall art I have hanging in my coffee nook, shall we? 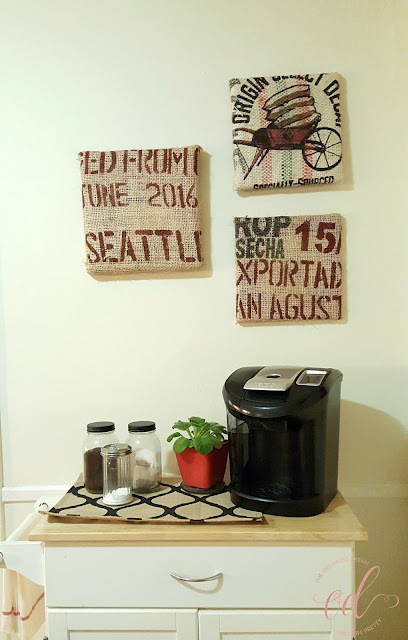 It's amazing what you can do with burlap coffee sacks! I simply took some old canvas art prints I had lying around and wrapped them with various prints from different sacks that I liked the most. I do have to say that I didn't realize how big these suckers were, but I am really excited with the outcome because the writing became a little more abstract once I was done. 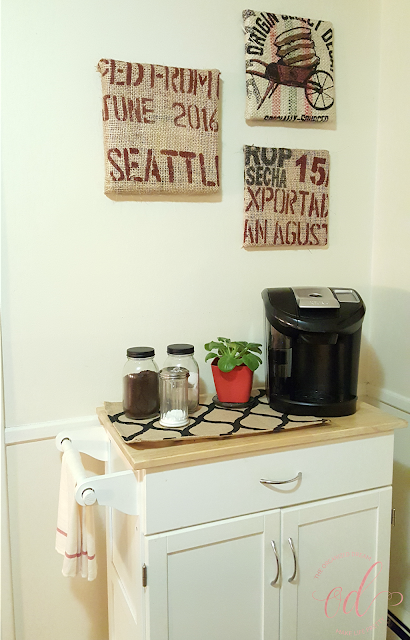 There are more subtle ways to add burlap to your home as well. I used a burlap napkin in my centerpiece. I tucked it around a few milk glasses inside a planter box. As soon as I start whipping out the Spring decor, these babies will be filled with flowers. 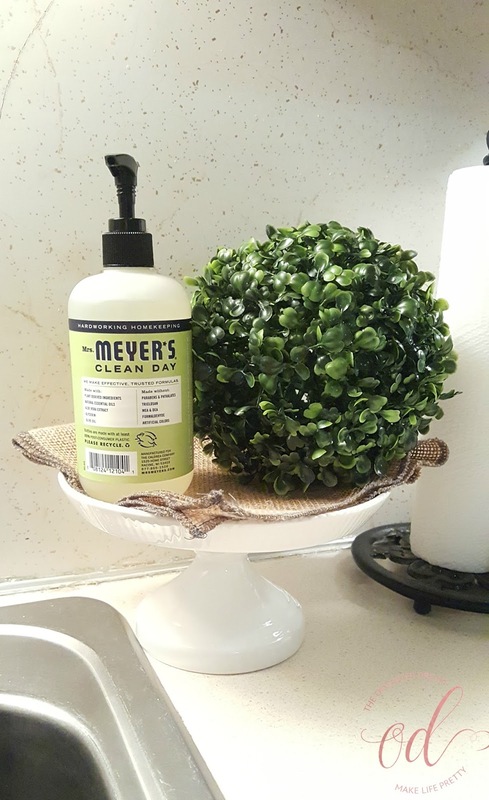 I've also folded a burlap napkin and put it on a cake stand to jazz it up with a boxwood ball and hand soap. You can add more rustic touches to your home as well with canvas. 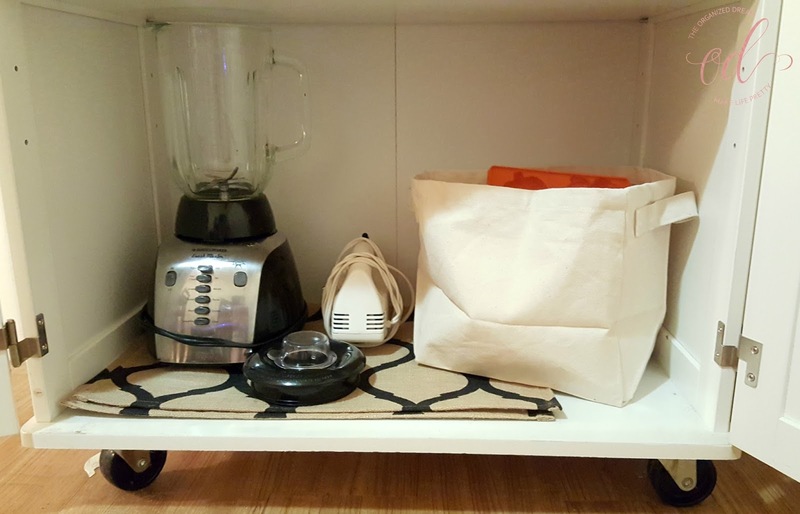 This fun little basket is used now to hold my baking supplies, but I plan on using it as a centerpiece for the summer. 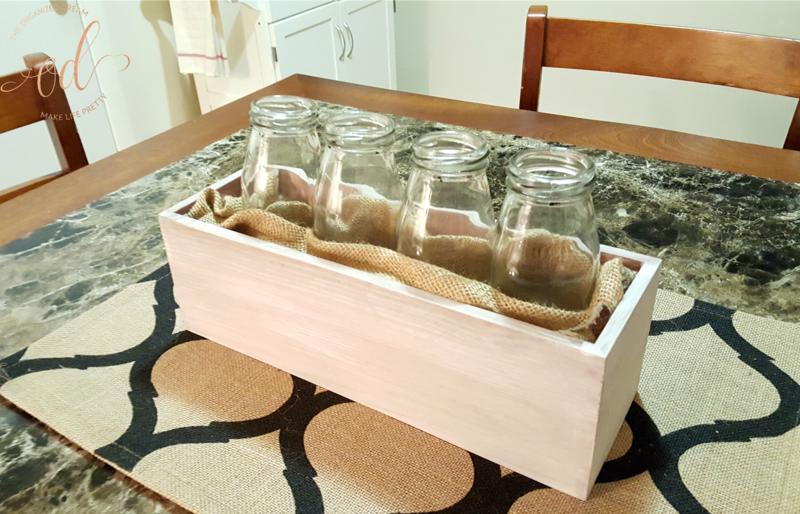 You could also cover this with a coffee sack as well, but because my ultimate goal is to use this for food, I didn't want to have an old coffee sack on it because they're unwashed and a little dirty. I found all of these awesome products at BurlapFabric.com. 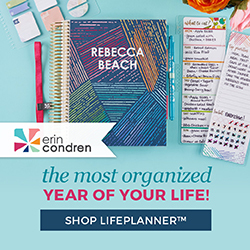 They were kind enough to send me some of these supplies and I suggest you check them out because they have a TON of burlap decor, fabrics, wedding supplies and more! Their prices are super affordable as well! 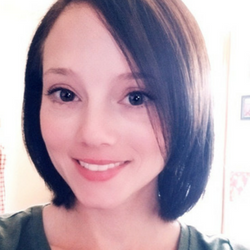 If you're looking for supplies for a DIY project in the future, you're going to want shop with them. I really liked these bags, however they do come unwashed and have a slight smell to them. The smell did disappear over a short period of time. They are large and prints do vary. I originally received 6 sacks, but because there were only three different prints, I only used these to make the canvases. This bin was well worth it. It's made of a thick canvas material that is sturdy enough for anything you throw at it, but it is small. I would find it great for use in a pantry or as shelf storage. These burlap napkins are a beautiful natural grey color, but are a little stiff and not soft at all in my opinion to use as a dinner napkin. That is why I would suggest to use them in decor instead. This post was sponsored by BurlapFabrics.com. All opinions are my own.